Each year our Crankworx experience in Whistler is one to remember. Ten epic days of riding the downhill mountain bike park and technical cross country trails, world-class racing and competitions and catching up with industry friends is a great way to celebrate the bikes we love so much. Kirt raced the Dual Slalom and said, “The course was technical and fast with a lot of high-speed manual roller sections and it was fun to race!” During the race young Tyler McCaul capitalized on Kirt’s berm blowouts in the first round for the transfer spot. As disappointed as Kirt was to leave the race so early, he was equally excited to see Tyler kill it out there! However, the best part of the Dual Slalom was seeing Kyle Strait take the win! Santa Cruz AllRide Academy member Austin Aldrich had an amazing Dual Slalom race. He is still fairly new to racing and took out some seasoned racers to place 3rd in the Jr. division. That firey redhead is going to be a star! Next up was the infamous A-Line “Air Downhill” where riders race down a 4+ minute track full of tabletop jumps and sweeping berms. The course was in need of some moisture and Mother Nature fixed her right up. With a solid day of rain the day before the event, the course workers slaved away to rid the corners of any pesky chatters or potholes. Kirt said: “With over fifty tabletop jumps A-line is one of the most fun but stressful DH races there is. You must stay low and scrub over every jump at top speeds without overshooting the landings. I was happy with my run but almost killed myself when I hit the last table exiting the trees. They did some course maintenance before the finals and steepened the previously flat lip. I landed to flat, hard”. Overall Kirt was super excited about his run and ended up 10th against some gnarly current world cup racers. Great job Kirt! The highlight of the trip had to be Kirt’s “Camelbak Karaoke Kickout” Jump Jam! We planned this funny idea with Camelbak a few months back and weren’t quite sure how it would pan out. It ended up being a huge success! 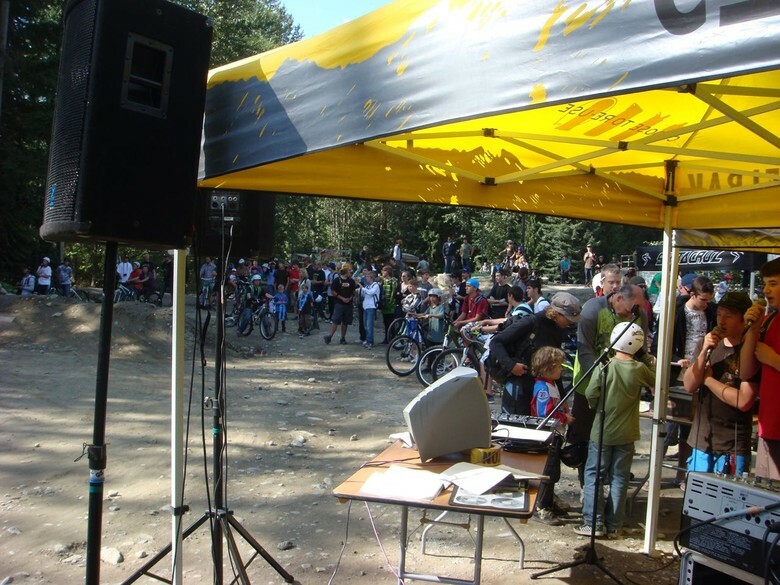 The Dirt Jumps were packed with both eager riders and singers! I cooked 200 hot dogs and gave them all out in under an hour and Kirt played deejay and encouraged the brave souls who belted out tunes in exchange for some super sweet swag! The dirt jumpers flipped and whipped through the pack, the singers sang, the eaters ate and the crowd enjoyed the spectacle! With so much going on and the constant riding, I didn’t take as many photos as I normally do. I rode more cross-country this year than downhill and must say I am impressed by the difficulty of the trails around Whistler. I rode the Blur LT Carbon and it was the perfect bike for the powerful, technical climbing and the super technical, wet, rooty, rock-drop laden downhills. That bike, my Rockshox PIKE fork and my CrankBrothers Joplin seat post saved my life a few times down some rock rollers and ladder bridges. I was fortunate enough to do a killer XC ride with our Smith Optics sponsor and friend Gabe and his buddies and boy oh boy did we do a ride to remember! Whistler’s a sweet place to ride it. UP NEXT: Mountain Bike Oregon in Oakridge, OR. Demos, Deschutes Brewery beer and riding galore! Thank you to all of our life support... You’re keeping the dream alive.